Time never matters more than when saving for a long-term goal. Retirement is most people’s longest-term goal. Here’s why time matters. 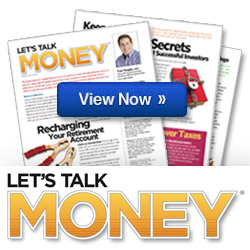 See this month’s issue of Let’s Talk Money, these tips may give you a better retirement outlook. When will you begin taking monthly Social Security benefits? You qualify for full benefits once you reach full retirement age. That’s age 66 if you were born in 1954, rising to age 67 for those born in 1960 or later. But drawing Social Security early will reduce your benefits, while delaying can increase them. The FAFSA is the federal government’s Free Application for Federal Student Aid. Most colleges require the parents of prospective and current students to fill out the form even if they are only applying for school aid and not federal aid. As the tax filing deadline nears, talk naturally turns to the subject of reducing taxes on this year’s return. When investing for retirement, you could look at taxes in a different way: What will your total taxes be over your lifetime? A Roth IRA could help you lower the number to this question’s answer. Ask a question or share a comment relating to the post.